Alright. Regular readers will know that I’m a fan of Washington Irving’s short story The Legend of Sleepy Hollow . 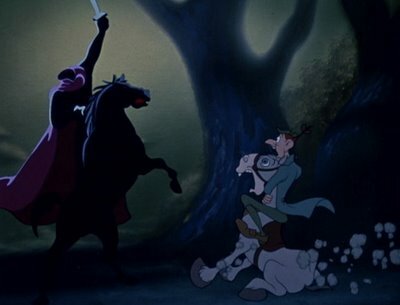 What you might not know, and what I myself didn’t know until I watched it last night, was whether I was a fan of Tim Burton’s film adaptation of “Sleepy Hollow.” Turns out I am not. I mean, it was an alright movie. Johnny Depp was entertaining as Ichabod Crane, of course. And on the Halloween-movie spectrum of spooky vs. slasher it definitely tended toward the former, which is a good thing in my book. But what on earth did it have to do with Irving’s original story? Not a whole heckuvalot. There were some recognizable character names, not to mention the 18th century Hudson Valley setting…. aaaaand that’s about it. They transformed Ichabod from a skittish country schoolmaster to an indignant New York City constable. Then they invented a complicated cabal of village elders and backstabbing occult characters, and turned the whole thing into a serial-killer murder mystery where the headless horseman isn’t even the villain by the end of the movie. Is it a passable Halloween diversion? Sure. But if you’re looking for a faithful literary adaptation, I’ll point you instead to the Bing Crosby-narrated Disney classic.